Students are working on letter mazes Ff through Jj from Education.com, which can be found here. This round, the booklet is called A Fireman, featuring the new sight word a. The book is from Hubbards Cupboard, and can be downloaded here. See here for the previous post that describes this activity in detail. At this station, students practice building color words, based on the characters from Brown Bear, Brown Bear, What Do You See? by Bill Martin Jr. The book Brown Bear also coincides with November's 5 Senses theme, with its focus on the sense of sight. Inside the Power Tower tube are words printed on Dixie cups. Students stack the words they can read and see how high their tower can grow. This idea was posted here, and is from teachertipster.com. I went on the website puzzlemaker.com and created word searches that had my students' names as the words to find. One side of the sheet has the boys' names and the other has the girls' names. 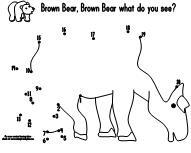 These dot-to-dot activity pages make each of the characters from ﻿Brown Bear, Brown Bear, What Do You See? by Bill Martin Jr.